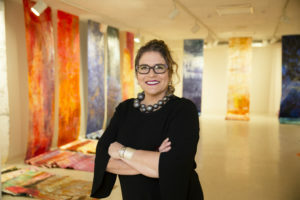 For artist Anne Labovitz, a native of Duluth, Minnesota, communicating and making art with people from around the globe is a profound triumph. From its inception, 122 Conversations: Person to Person, Art Beyond Borders was about people, and how cross-cultural dialogue and the purposeful act of making art could weave a tapestry of commonality. 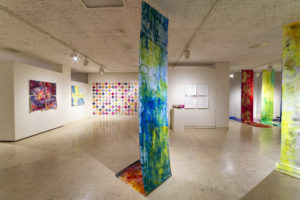 A collaborative six-year project stretching from 2012-2018, its participants lived in Duluth, Minnesota, and its five sister cities, Thunder Bay, Ontario, Canada; Rania, Iraqi Kurdistan; Växjö, Sweden; Petrozavodsk, Russia; and Ohara Isumi-City, Japan. In our current era of chilling divisiveness poised on an underbelly of distrust, 122 Conversations functions like an international kiss of unity. Anne succeeded in executing a meaningful and socially engaged project that refutes our fraught times, and served as a visual tonic that reinforces ideas of community, shared-authorship, and goodwill. More relevant now than in 2012, 122 Conversations confirms that beauty exists, and people from diverse cultures, religions, races and countries can communicate with each other, and work collaboratively with civility and love. The socially-engaged 122 Conversations transpired into equal parts public art, a listening archive, and a goodwill ambassadorial adventure. Her goal was to seed cross-cultural understanding and a spirit of compassion by bringing people together through conversation and art. 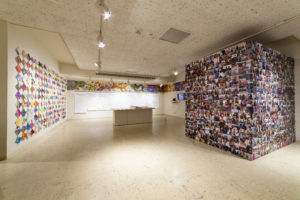 122 Conversations installation at Tweed Museum of Art, Duluth, Minnesota. Anne collaborated with the organization Duluth Sister Cities International who organized interviews via Skype between Anne and 10 individuals who lived in Duluth and in each of its sister cities. 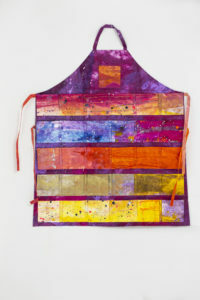 From these recorded conversations, Anne made art that serves as the core to larger celebrations in each city. Over the project’s ambitious arc, Anne connected with more than 3,000 people who created more than 2000 artworks. Each interviewee was asked the same questions, often through a translator. Assuming a humanist mantel, she carefully delved into each subject’s life: where did they live and work? Did they go to school? What foods did they eat and what mode of transportation did they use? Who comprised their family? What did they do for fun? The general questions became “really personal as I leaned in on who these people were,” explained Anne. Inspired by Thunder Bay for Duluth 2017, acrylic, Tyvek. After making paintings on paper from her initial 10 listening sessions with Thunder Bay participants, Anne realized paper would be too cumbersome to ship around the world. 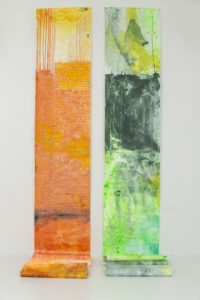 She switched to painting on long sheets of Tyvek, used as an architectural wrap in building construction. The resulting scrolls of abstract pattern, luminous color, and cryptic text were not only affordable to make, but durable enough to be shipped anywhere. 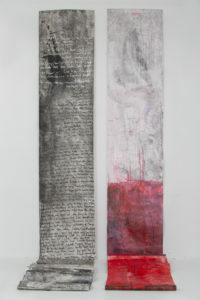 The scrolls, which measured 30” wide and as long as 596”, were executed when Anne felt, after repeated listenings to the recorded conversations, a symbiotic kinship with her interviewees. Working in her studio, she transmuted their images echoing in her head and the complex rhythms of their different languages into works of art. 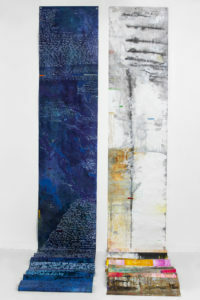 In the end, seven sets of two scrolls, or diptychs, were sent to each sister city for the respective exhibitions. With efficiency and cost being major considerations, shipping issues were solved by a lowly suitcase. For each sister city, (excepting the initial Thunder Bay phase) the 14 scrolls were packed in a white Tyvek bag, and shipped around the world in a single, black 26” x 18” x 10” suitcase on wheels, which weighed less than 45lbs. Duluth Whole 2017, acrylic, polymer emulsion, graphite, Caran d’Ache, Rives BFK paper, 40″ x 40″. 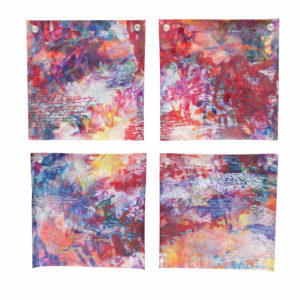 In essence the scrolls are abstract portraits, inspired by person and place. At each site they were shown, suspended from the ceiling like expressionistic veils of memory that pooled onto the floor. An orchestra of jewel-toned color, fluid material and cryptic text, the scrolls created a meditative environment at each location. 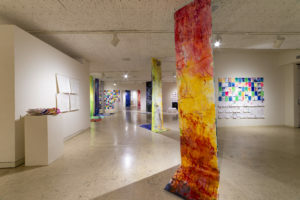 Exhibited in consort with the scrolls were additional works comprising of figurative drawings, abstract markings, and associative writing made by project participants from Anne’s artist-led workshops and public interventions. Inspired by Petrozavodsk for Japan 2017, acrylic, Tyvek. 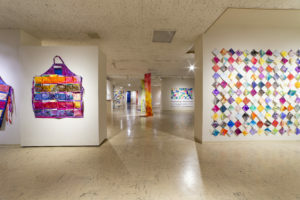 The first exhibition, with attendant workshops, opened in Thunder Bay, in September 2015. The second opened in March, 2017 in Växjö, Sweden followed by the same in Petrozavodsk, Russia, Rania, Iraqi Kurdistan, and ending in November 2017 in Ohara Isumi-City, Japan. It was only fitting that the Tweed Museum of Art at the University of Minnesota, Duluth, hosted the final 122 Conversations show. It opened quietly to the public in September 2018, followed by a grand opening celebration in late October, and closed in January 2019. Choices 2017, large apron, Duluth. 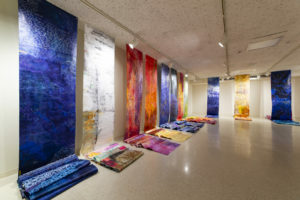 If Anne’s colorful scrolls are mesmerizing with their striking rainbow drama, the real stars of 122 Conversations were the project participants who joined their artistic voices with that of a previously unknown artist. Whether kids or adults, these fledgling artist-communicators had the opportunity to understand and work in a positive manner with each other. That’s where the Person to Person Art Beyond Borders comes in. Inspired by Rania for Japan 2017, acrylic, Tyvek. In our current era of chilling divisiveness poised on an underbelly of distrust, 122 Conversations functions like an international kiss of unity. Anne succeeded in executing a meaningful and socially engaged project that refutes our fraught times, and served as a visual tonic that reinforces ideas of community, shared-authorship, and goodwill. More relevant now than in 2012, 122 Conversations confirms that beauty exists, and people from diverse cultures, religions, races and countries can communicate with each other, and work collaboratively with civility and love. So, what’s Anne Labovitz’ next adventure? The I Love You Institute, an initiative with roots in art and social justice. Bravo! – A 144 page catalogue, 122 Conversations: Person to Person, Art Beyond Borders, 2018, was published by The Tweed Museum of Art. NextEnchanted on the Amalfi Coast ~ No April Fool!